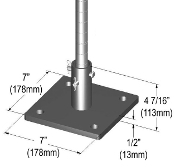 Metro Seismic Preapproved Bolt Plate Kits are available for 1" (25mm) diameter post assemblies that are compatible with Super Erecta (SES), Super Adjustable Super Erecta (SASE) and qwikSLOT (QS) Series. This 1/2" (12.7mm) plate (50BP Series) is rated for 50 lbs. psf. For Specifying Guidelines Seismic Anchorage for Free Standing, Floor Anchored Shelving OSHPD, click here for sheet LO4-160. One-Post Bolt Plate, #SASES50BP-1, includes (4) pieces per kit, 7" x 7" x 1/2" (178x178x12.7mm). Two-Post Bolt Plate, #SASES50BP-2, includes (2) pieces per kit, 7" x 12" x 1/2" (178x305x12.7mm). 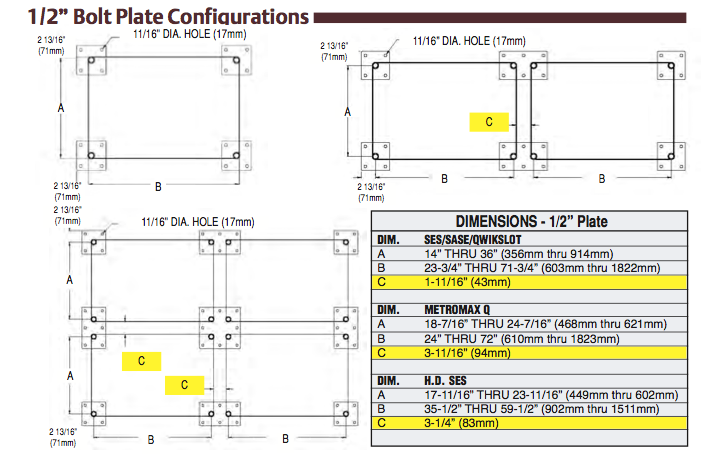 Four-Post Bolt Plate, #SASES50BP-4, includes (1) piece per kit, 12" x 12" x 1/2" (305x305x12.7mm).